There's nothing we love more when great product and gorgeous packaging collide, and Christian Louboutin's impeccable beauty collection has never disappointed in this respect. Duly inspired by the brand's luxe-minded fashion aesthetic, its nail polishes and lip colors are modeled after stilettos with ornate, lacquered finishes—and contain equally extravagant formulas within. So when we first heard whisperings of an upcoming eye makeup collection, we could only imagine what opulence was in store. Sure enough, we're finally getting our first look at the exciting new range today. Due to arrive in stores and online on March 23, Christian Louboutin's Les Yeux collection will include liquid liner, brow pencil, mascara, and colorful eye pencils. And if you need any proof of how Instagram-friendly these upcoming launches will be, just keep scrolling to take a look. Can you guess what lies inside this bejeweled receptacle? That would be the brand's new Lash Amplifying Lacquer Mascara ($70), which will be available in inky black and burgundy. Graphic colorful eyeliner is having a serious moment, and these perfectly-textured Velvet Eye Definers ($40) will make channeling the trend a breeze. Find the kohl pencils in black, rich brown, plum, peacock blue, and the chartreuse-yellow seen above. Even if you don't exactly intend to cop such a dramatic look as seen in this campaign image, the brand's new Brow Definer ($40) can help add even just a little definition to sparse arches. Similar in aesthetic to the stiletto-esque nail lacquers, the calligraphy-inspired Luminous Ink Liner ($75) will be available in black, an aqua blue, and—of course—Louboutin red. 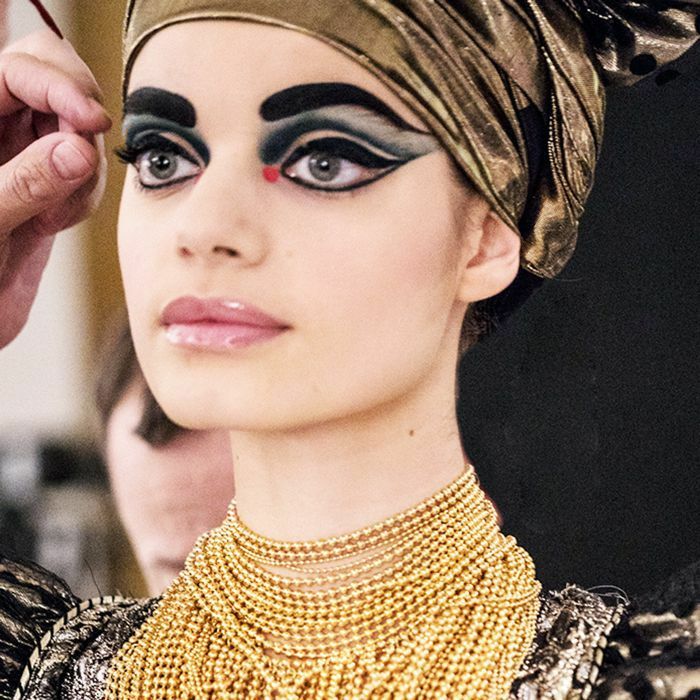 Louboutin was inspired by both ancient Egyptian makeup and elaborate Art Deco designs, and says that creating eye makeup specifically was a long-awaited goal. "You definitely see everything through the eyes," he reveals. "You can see happiness, sadness, fear, fierceness…"
With such elaborate new makeup tools to play with, that last attribute seems like a clear given. Shop the new collection starting March 23 in Christian Louboutin stores and online.